The vibration meter PCE-VM 3D provides quick and simple measurements of acceleration, displacements and acceleration speed to check accelerations of machines and construction parts and machines. The vibration meter PCE-VM 3D is able to record vibration in three dimensions on the x-, y- and z- axis. Therefore defects and larger unbalances can be determined. The large display of the vibration meter PCE-VM 3 D allows capturing momentary values as well as recording a whole vibration spectrum. 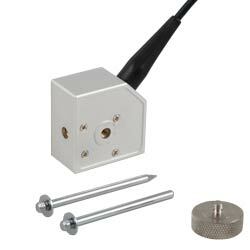 Optionally in addition to this vibration meter there are also additional measuring sensors provided. The large display of the vibration meter PCE-VM 3D features background lights and is well eligible. With its weight of only 305 g the vibration meter PCE-VM 3D proves to be a light accessory at any workplace, whether it is a larger or smaller business, that needs to measure oscillations or larger unbalances on its machines. The determination of errors, defects or larger unbalances can increase the life time of machines and engines significantly. The vibration meter PCE-VM 3D can also be calibrated according to ISO. By checking the oscillation movement of your machines by means of the vibration meter you can also prevent larger damages (by locating the source). In case that you should have more questions regarding the vibration meter PCE-VM 3D, please read the following technical data, use our contact form or call us: UK customers +44(0) 23 809 870 30 / US customers +1-410-387-7703. Our technicians and engineers will gladly advise you regarding the vibration meters or all other products in the field of Control Systems, Laboratory Equipment, Measuring Instruments or Scales and Balances of PCE Instruments Ltd. The delivery covers in addition to the vibration meter PCE-VM 3D, also an adequate cable with a measuring sensor in a case that is included in the delivery. To attach those there are also two measuring tips and magnetic sensor included in delivery. The instruction manual is also included. The standard sensor included in delivery captures values three dimensionally. 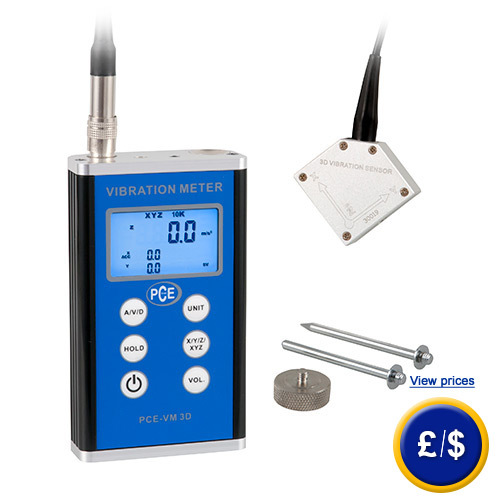 The vibration meter PCE-VM 3D then determines precisely the relevant values. In order to attach the sensor there are also magnets included in delivery that sticks on any magnetic surface. Even two measuring tips are included in delivery as well as two measuring tips that can be attached to the sensor. 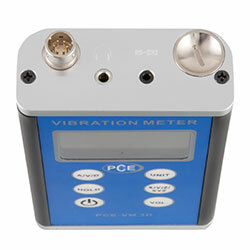 The vibration meter PCE-VM 3D features three connections on the head side. One five-pole sensor input, there the sensor is to attach, one RS-232 interface (2.5 mm) and a head phone connection with 3.5 plugs. Documentation required for businesses that wish to incorporate the vibration meter into their group of internal control tools or to perform an annual recalibration. The certificate contains the manufacturer's calibration certification and a test certificate with the measurement values. The certificate also includes the applicant company's information. A periodic signal can be described in terms of a Fourier analysis as a mathematical Fourier series, i.e. the summation of sinusoidal and harmonic partial oscillations. Therefore the periodic functions can be created by overlaying the partial oscillation. For further information follow link.